In the Tudor period London’s sea trade rapidly increased, particularly the export of English wool and cloth. A group of London businessmen known as the Merchant Adventurers emerged in the 15th century, dominating the booming business in English cloth to Antwerp, and Letters Patent were drawn up in 1505 to bring them together as a single company. A new law of 1558 restricted the loading and unloading of goods in London to a limited number of quays on the north bank of the river in order to simplify the collection of duties. The trading rights of the Hansiatic League of Germanic merchants who had long been a fixture in London were withdrawn and their base at the Steelyard closed in 1598. Ship-building increased down-river of London, particularly after Henry VIII moved the main base of his navy to Deptford and Woolwich. By the end of the 16th century the area east of London was the largest concentration of ship-building and repairing in the country. Also based at Deptford was the newly-formed Trinity House, a corporation that was given responsibility for safety on the river and continues to operate England’s lighthouses in modern times. The collapse of the cloth trade to Antwerp in the mid-century forced English merchants to seek new trading routes. Long-distance voyages led to the sharing of risk by merchants and ship-owners with joint-stock companies formed. These merchants met to do business in various places until Thomas Gresham established a building based on the bourses at Venice and Antwerp, it was officially opened by Queen Elizabeth in 1571 and named the Royal Exchange. 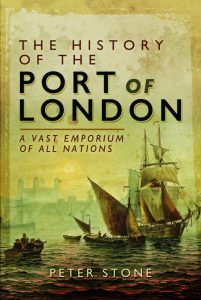 In 1577 Francis Drake set out with five ships on a voyage financed by London merchants. His two-year circumnavigation of the globe was only the second-ever attempt and the first by an Englishman. After his return the Queen dined on board Drake’s ship, the Golden Hinde, at Deptford and knighted him. The vessel was dry docked there as a memorial for many years until it disintegrated.